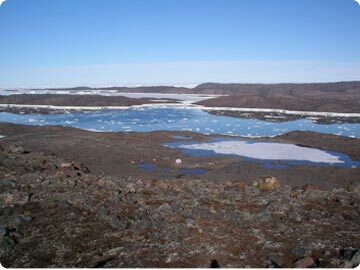 Members of the Inglefield Land Archaeology project are back in Greenland for the summer of 2009. This year they will be working at two sites, at Paris Fjord and Marshall Bay. The team includes researchers from Bowdoin College, University of California, Davis, The National Museum of Greenland, The University of Greenland, and Laval University, and Calgary. The project is funded by a grant from the National Science Foundation, Office of Polar Programs, with additional support from Bowdoin College, University of California, Davis, and the Greenland National Museum and Archives. The ILAP crew arrived at the Thule Air Base on June 18, where they had a day to prepare all the field gear that had been shipped up in the spring. On the 20th they flew by helicopter from the Air Base first to Qaanaaq to refuel, and then on to a second refueling stop at the Hiawatha Glacier. Unfortunately they encountered fog and snow on the way, and were forced to turn back. The next opportunity to fly north would not be until the 23rd. This gave them the opportunity to participate in celebrations of Greenland's National Day on June 21 - an historic occasion as it marked the beginning of a new, expanded home-rule agreement between Greenland and Denmark. Luckily, by the 23rd, the weather had improved and the crew made it all the way to Paris Fjord, where they established camp in the same location as the 2005 survey camp. Blog posts have been delayed by technical difficulties on this end, but now things are working well. In Alison's first post she introduces the crew, and describes the early stages of the excavation. In this week's report, Allison describes some of the wildlife they have seen, a change in the weather, and some of the exciting finds the team has made. As always with satellite phones, the sound quality is variable. Early on, Alison sounds garbled, but the quality improves, so keep listening! In other news, Christyann and John Darwent have reported some delays in the arrival of the two final members of the team, Hans Lange and Hans-Kristian Lennart. The two were scheduled to fly to Thule from southern Greenland on Monday, only to be turned back by 76 knot winds - that's over 80 miles per hour. Subsequently they flew from Kangerlussuaq (formerly Sondrestrom Fjord) to Copenhagen, where they were scheduled to try again to reach Thule. Stay tuned to see if they made it! After a brief delay, Alison is back with a new entry, in which she describes the work that has been keeping them busy, including many exciting finds, and talks about the many challenges of Arctic research. In other news, Hans Lange and Hans-Kristian Lennart finally arrived from southern Greenland after a detour through Copenhagen. With their arrival, the them split into two, with Chris, Fred, Alison and Erika staying to continue the work at Paris Fjord, while John, Jeremy and the two Hans' setting up a new camp in Glacier Bay, a little ways to the south and east. There they are excavating a possibly early Thule winter house and completing the survey. John reports that work is going well. Thanks to the excellent weather, and the first ice-free conditions we have experienced in the area, they have been able to survey along the coast by inflatable boat (we have had a boat with us most years, but have been prevented from using it by ice conditions). Excavations in the house are also going well, although complicated by the recent discovery that the Thule people who built it positioned it directly on top of an earlier Late Dorset tent ring – not uncommon, but it will make dating the occupation of the house a challenge in this area, where there is considerable overlap in dates from Thule and Late Dorset sites. "The season comes to an end"
The 2009 field season has come to a successful finish. In her last blog post Alison reflects on the summer's work an it seems while she is glad to be coming home, she would certainly do it all over again.